The sun going down along the Ashley River by the Coast Guard Station. 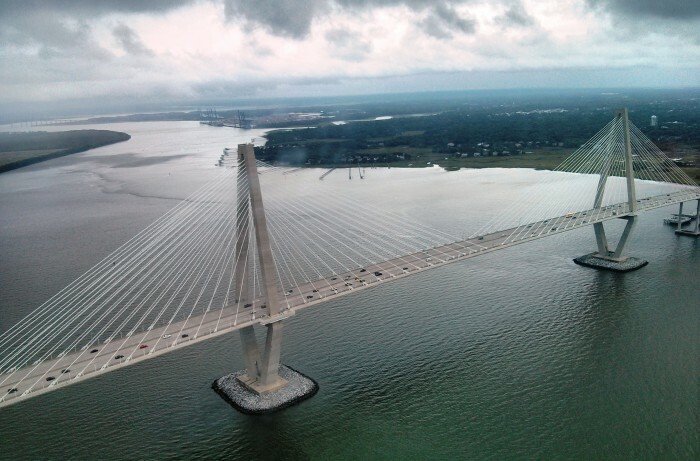 Helicopters come in handy in so many ways, including providing amazing views of the Ravenel (Cooper River) Bridge. What’s the best caption for this photo? 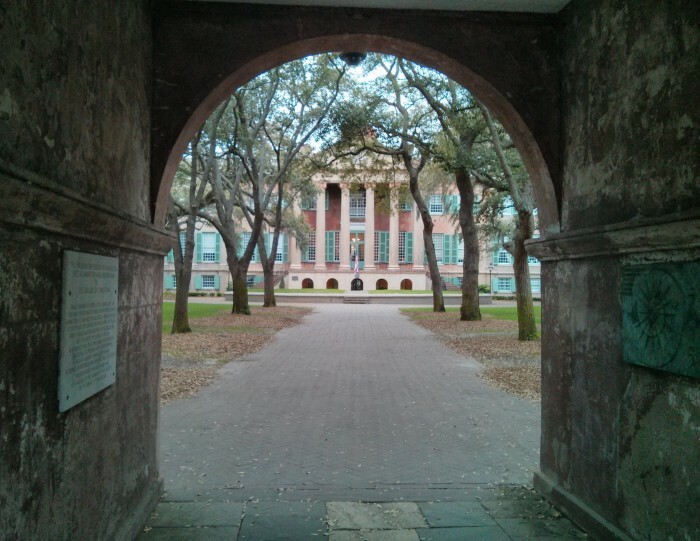 While walking around Charleston, it’s well worth taking a peek through a gate and seeing what’s on the other side. The gardens and yards are generally beautiful and may contain an eye-catching fountain or statue. This yard, surrounded by hedges and walls is located on lower Meeting Street, at the corner of Ladson Street. 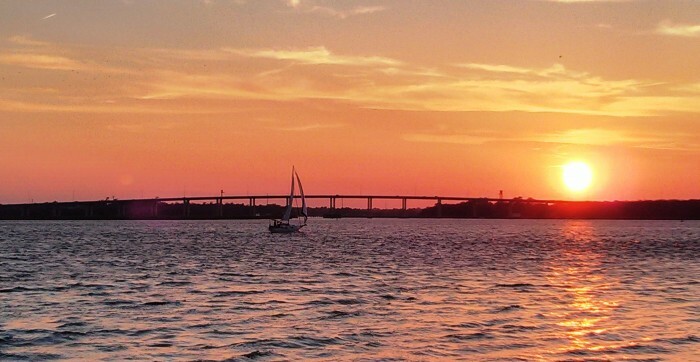 The Low Battery along the Ashley River is a wonderful spot to watch the sunset in Charleston. It’s always fun to watch the boats racing the sun to get back to the marinas. 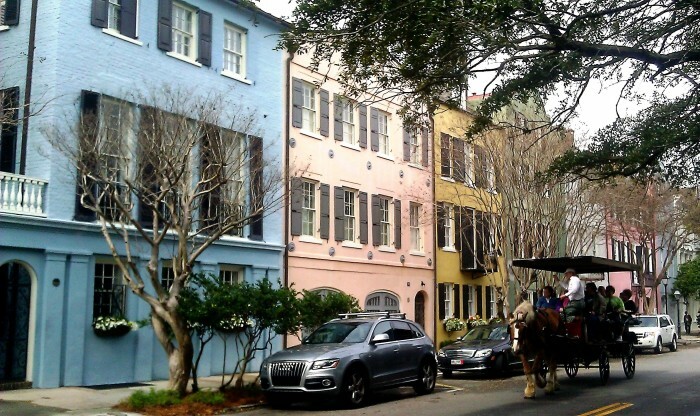 The mandatory shot of Rainbow Row. 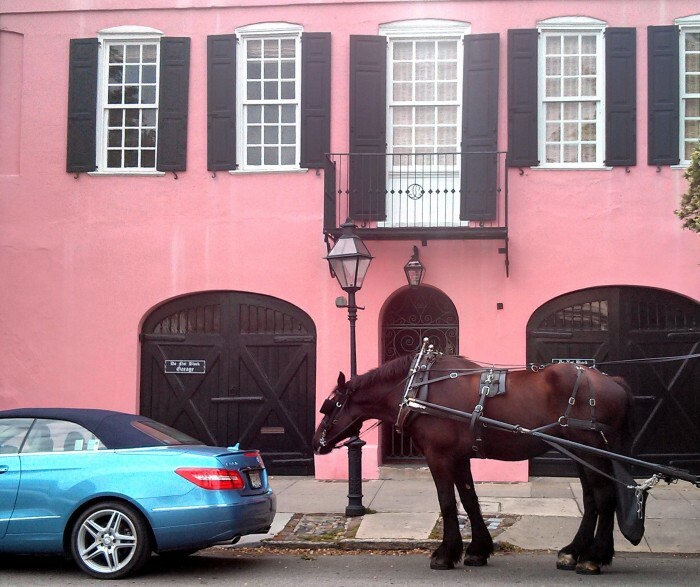 Tucked behind Broad Street is a one block street that runs between Meeting and Church Streets — St. Michael’s Alley. 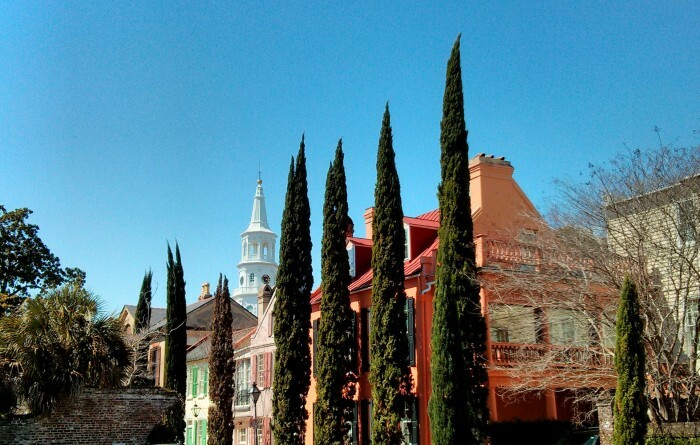 With these distinctive Italian Cypress trees lining the way, it’s a great “cut-through” when you are out for a walk. 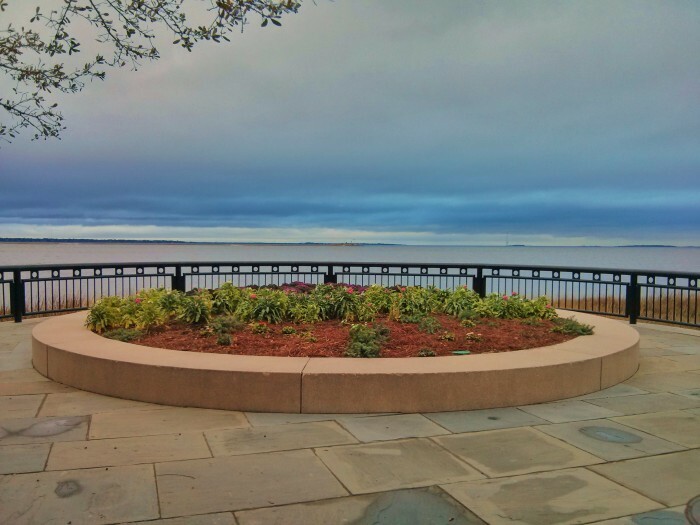 In a relatively small space, Waterfront Park provides many experiences — from fountains to play in, piers to stroll and fish off, grass to picnic on, bench to rest on and paths to stroll. 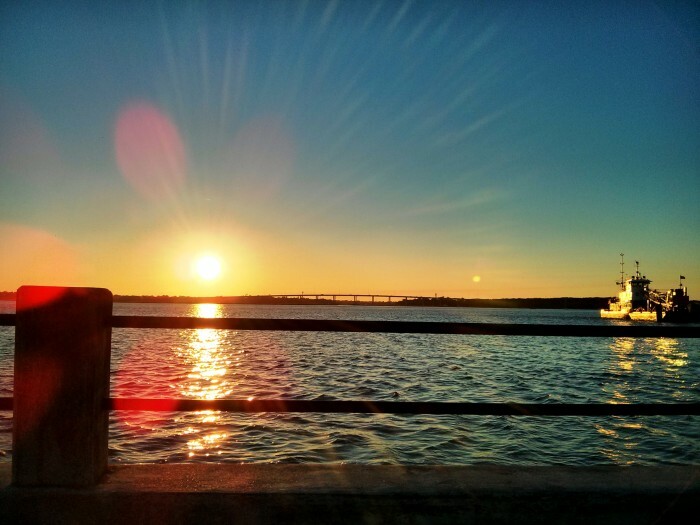 Wonderful views too… including the Ravenel (Cooper River) Bridge and all of Charleston Harbor. 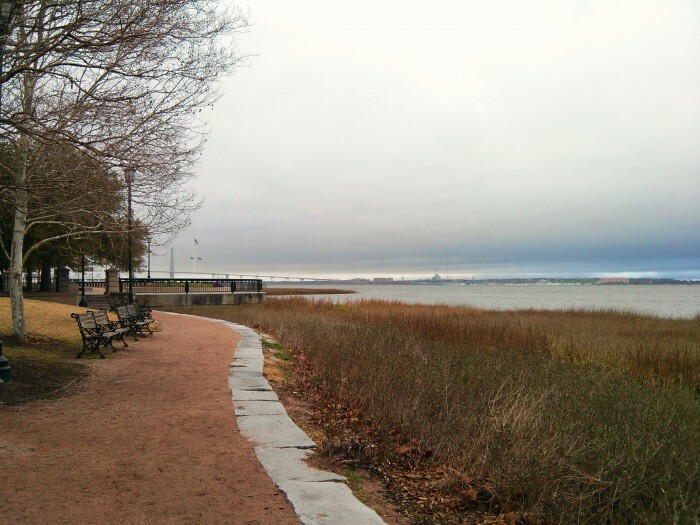 If you look straight past the very cold looking flowers at Waterfront Park, you can see Shute’s Folly — a small, low lying island in the middle of Charleston Harbor. 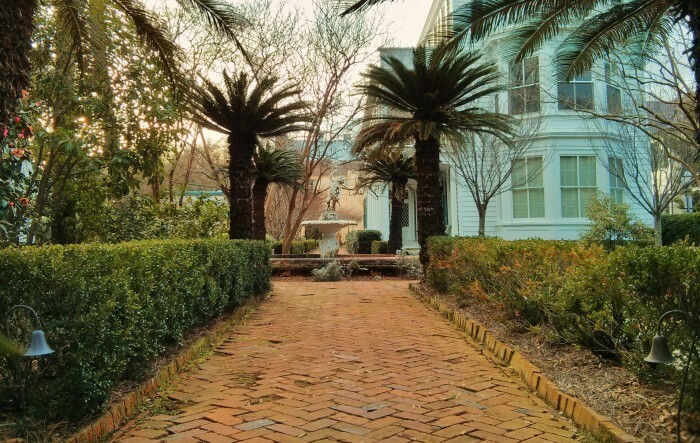 Originally used to house defensive fortifications for Charleston, the property was bought by Charlestonian Joseph Shute in 1746 — for which he seems to have been ridiculed. Over time the island passed through a number of ownership hands, but retained the Folly name. It eventually became home to Castle Pinckney, which was originally built in 1797 and then demolished in 1804 by a hurricane. The masonry Castle Pinckney, whose remains can still be seen, was completed in 1808. Unlike Seward’s Folly, which picked up the snappy new name of Alaska, this folly remains credited to poor Mr. Shute. Randolph Hall built in 1828-1829, the main administrative building at the College of Charleston, is one of the oldest college buildings still in use in the US. 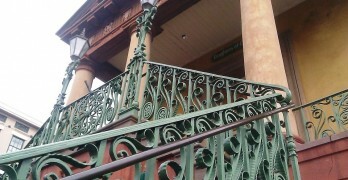 The Porter’s Lodge, built in 1850, provides a neat frame for it.